You have started your search for the best chicken coop, and we are happy to help you find it. There are various types of chicken coops for sale and because of that, it might be a little difficult to make a decision. But, have no worries because we have some options for you and the first one is the SnapLock Formex Large Backyard. This product is sturdy and promises to withstand various impacts, and it is also resistant to water and ultraviolet rays. It is made in the USA and it is very easy to assemble. You don’t need special tools – you just have to snap together all the pieces. And, the fact that the litter tray is removable makes it super easy for you to maintain your chickens’ house clean and safe. Another good chicken coop is the Little Cottage Company Gambrel which promises to offer very similar results. This easy-to-assemble chicken coop is a perfect choice for anyone who is looking to accommodate anywhere from 4 to 6 large chickens. And, if you have Bantams chickens you can fit 6 to 12 of them. It is lightweight but very sturdy at the same time. It resists well to water and chemicals, and it is also resistant to impact and ultraviolet rays. A few customers have mentioned that the nesting boxes might be a little too small for larger chickens. If you are looking for a house for your chickens that is easy to maintain and install, this product might be just what you are looking for. This kit is not difficult at all to put together and it will offer your chickens all the necessary comfort. It has never been easier to collect fresh eggs straight from your backyard. Your birds will be happy that their house has nesting bins and an egg-laying area. And, you can paint it yourself in order to match your surroundings perfectly. Several customers say that it is quite heavy and it has to be unloaded by at least 2 men when you receive it. The fact that you can paint this product in the color you prefer makes it a perfect choice even for the pickiest customers (and chickens). If you are looking for a house for your chickens that is made from high-quality materials, you should look no more because you have found it. This product is made from strong fir wood that was T&G plained in order to prevent splintering. And, it is large enough to accommodate 6 chickens or 10 Bantam ones. Some buyers who have purchased the product say that the pictures make the coop look bigger than it actually is. This house offers your chickens everything they need and it also offers you easy access to them whenever it is necessary. In order to offer you a more clear and detailed description of some of the most popular products, we have decided to prepare the list below. These chicken coop reviews have the role to help you understand what it is that you need and to help familiarize you with the benefits and drawbacks of every single product. This large chicken coop is equipped with everything your chickens need – it has 4 nesting spots which are separated with dividers that can be removed, if needed and 3 roosts. Your chickens will have the option to lay eggs in the nesting spot and sleep on the roosts. And, installing it is a piece of cake – anyone can do it – you just need to snap the pieces together. Even if it is lightweight, this product promises to be sturdy enough to resist water, various impacts, and ultraviolet rays. It is very easy to maintain, too, thanks to its removable litter tray and the large ventilation that can be adjusted. Also, the way this coop was manufactured offers you easy access for egg collection. You can fit anywhere between 4 to 6 large chickens, and if you have Bantams chickens, you can fit about 6 to 12 – it depends on how big your yard is or how much external run space is available. Many customers are pleased with this hen house because it is very easy to clean – both inside and outside – which means that you can use your time to do other things that you truly enjoy. Because it doesn’t require maintenance like painting, or repairs, this coop is a perfect choice for people who have a very tight schedule. Many people like the design and they also appreciate the fact that it is very easy to put together – no need to read further complicated and time-consuming instructions. Many buyers consider this a portable chicken coop and a good choice for anyone who likes to move things around more often – they can take it apart in no time and then put back together. Some of the customers who have decided to give this product a try say that the nesting boxes are a bit too small. However, they can always remove the dividers to make more space. Several customers complained about the plastic trays inside the coop – they say that they do not hold up too well. We like chicken coop kits because we can assemble them ourselves, and this one from Little Cottage Company is no exception. It comes with everything you need in order to be able to install the aluminum gable vents as well. And, in order to match it perfectly with your surroundings, this hen house was primed so that you can paint it in the color you prefer. Now, you can have fresh eggs straight from your backyard thanks to this product. The food we eat is very important for our good health, and organic fresh eggs can be quite expensive sometimes. But, with this coop, you don’t have to worry about that anymore. Also, your chickens will help you keep your backyard clean because they will eat your weeds and some garden pests. Your feathered friends will feel safe and sound in their new home that has nesting bins with an egg-laying area that can fit between 6 to 8 hens. Many people are happy that is comes with very clear instructions on how to assemble it – anyone can do it, no prior knowledge or special tools are required. Many customers appreciate the fact that this coop has aluminum gable vents that offer all the necessary airflow so that chickens can cope well with those hot days in the summer. Thanks to this coop, customers can now keep their garden clean because the chickens will eat weeds and some destructive pests. Because you can paint it yourself in any color you want, this coop is a great choice even for those picky customers – it will blend in perfectly with the surroundings. Many customers like this hen house because it looks very nice and gets many compliments from guests. A few customers who have purchased this coop say that it can be a little heavy – it takes at least 2 men to unload it. However, all parts and supplies are included. Some backyard chicken coops can be difficult to assemble, but this is not the case with this one from Omitree. You just need a screwdriver and to follow a few easy steps and you are done – you don’t require special knowledge. And, another great characteristic of this product is that you can fit 6 large chickens in it, or if you have Bantam chickens you can fit 10 of them. The fact that it’s manufactured from high-quality fir wood makes it very resistant to various demanding situations. And, the best part about the timber is that it is T&G plained in order to keep it from splintering. Also, it is equipped with a ramp and large living area so that your chickens can enjoy the maximum comfort. To make it easier for you to catch your feathered friends, this hen house has not only 1 access door but 2 of them! Many customers prefer this product because it is very easy to install – you just need to follow the instructions and you are done – no special knowledge is required. 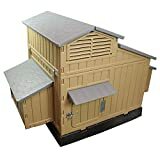 This coop is a great choice for people who have up to 6 large chickens or those who have up to 10 Bantam chickens – it can vary sometimes depending on the size. The fact that it is made from strong fir wood gives the customers the confidence that it will resist in time and it will not suffer severe damage from various weather conditions. Your chickens will just love their new home – they will enjoy enhanced comfort thanks to the ramp and the large living area. Many customers like this hen house because it is super easy to clean thanks to the zinc pull out tray. Some of the people who have purchased this product say that it is smaller than they expected it to be – the pictures make it appear bigger than it actually is. This hen house has a very useful design that offers multiple benefits to both your chickens and yourself. The fact that it has a nesting box with a hinged top, will make it easier for your feathered friends to deposit eggs and for you to collect them. And, the chicken coop run (enclosed by a fence) gives your hens enough room to move around in a safe environment. Also, the house is equipped with two roosts where your chickens can chill whenever they feel tired. Moreover, the windows with screens will make sure that your hens get enough ventilation and air flow. Another good aspect of this product is that it is also perfect for smaller places thanks to its compact design. Besides offering your chickens all the necessary comfort, this house is very durable, too, being made from treated wood that resists against various environmental factors. Many customers like this coop because it is super easy to assemble and you don’t need to read complicated instructions – you just need to follow some easy steps and you are done. Many people who have decided to give this product a try say that they like the fact that the roof is very sturdy and keeps the chickens dry. Your chickens will feel very comfortable in this coop – it is equipped with two roosts where they can relax and rest whenever they feel the need to do that. This hen house has screened windows which offer your chickens proper airflow and ventilation. Some customers say that there is an unpleasant smell coming from the roof which can be disturbing especially for those people who have a sensitive nose. Several customers say that they don’t really like the quality of the wood saying that it is not of the highest level of quality. This Pawhut chicken coop is not only suitable for your feathered friends but it can make a good house for rabbits, guinea pigs, or other small animals, too. It is set directly on the ground which means that your pets will enjoy a healthy and natural environment. There are many good cheap chicken coops for sale that offer great results, and this is one of them. The fact that is has multiple ramps offers your pets easy access to the inner box. And, the inner area is on top of the run area, and the great part is that they can both be opened from the front so that you can enjoy very easy access to your pets. Now, your pets will feel safe and comfortable thanks to the large living area. Another great characteristic of this product is that it is made of durable wood and it has a textured roof that will protect its inhabitants from various weather conditions. Many people are very happy with this product because it has waterproof roofs that allow them to house their chickens/rabbits outside in various weather conditions. We are happy when our pets are happy and this coop has proved to keep rabbits busy thanks to its interesting design. Many customers say that their bunnies love to go up and down the sturdy ramps and they also love the security the upstairs has to offer. Many buyers like this product because it is open to the ground so their rabbits can dig in the dirt and munch on fresh grass. If you are planning to use it for your bunnies, some customers say that you should add some more secure locks and create a hiding area for your furry friends to hide when scared. Some of the customers who have decided to give this product a try say that it can be a little difficult to reach in to clean the far areas – it isn’t impossible but it is a bit tough. This house is very large and it offers your chickens enhanced comfort and space. It is equipped with everything that your feathered friends need in order to enjoy plenty of benefits. The strong wire fences will protect your chickens from predators and will make them feel safe and cared for. Thanks to the hidden removable trays, it has never been easier for you to keep your chickens’ house clean and organized. And, you don’t have to worry about assembling it either because it is super easy. All you need is an electric screwdriver and it shouldn’t take you more than 45 minutes to install it. 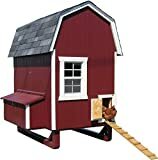 The exterior area and the roost storehouse are separated with stairs so that your chickens get to choose where they wanna be and what type of activity they wanna do. This coop will offer your feathered friends diversity so that they can fill up their day with various activities. Many customers like this coop because it is very large and it offers their chickens all the necessary space and comfort. Many people who have decided to give this product a try say that they like this house because it’s super easy to assemble – you don’t need to follow difficult and time-consuming steps. Many people are happy that this coop features strong wire fences which will protect their chickens from predators. The fact that it is equipped with removable trays makes it easy for you to keep your chickens’ house clean all the time. Your chickens will not feel bored in this house because they have different options on how to spend their time. Some customers recommend that you add some additional supports and corner bracings to make it more stable. They also advise buyers to add wood glue to joints to make it sturdier. If you are looking for a chicken coop that withstands the test of time while offering your feathered friends increased comfort, this one from Tangkula might just be your answer. It is made of strong fir wood which makes it very durable to various weather conditions. And, your health is also protected around this product because it is painted with non-toxic paint. You don’t need to worry that you will have to replace your chickens’ house very soon because this one will resist outdoors for years. Thanks to this completely safe paint, the coop is also waterproof, resistant to corrosion, and will not suffer sun damage. And, the way it is designed offers your feathered friends enough space, too. The house is built off the earth meaning that it creates a dry and warm environment for its inhabitants. Also, thanks to the wire doors, you are now able to supervise your chickens without interfering with their daily activities. Many people like this product because it is big and larger bunnies can even stand in it – the hideaway area is pretty big, too. Many people like the fact that they can close the opening for the ladder so that it becomes easier for them to clean the bottom. Because the instructions are clear and easy to understand, and all the accessories are included, this coop is a perfect choice for anyone regardless of age. Many customers find this cage very suitable for their rabbits, too, because they can eat the grass and they also have plenty of room to run around. Some customers say that there are some minor chips and one of the pieces is splitting. Overall, it doesn’t affect the quality of the product. A few buyers say that there is no bottom tray but this can be fixed by adding a suitable chicken coop floor underneath like wire or something else. This coop is made from a high-quality steel frame that offers your chickens all the necessary space. Now, they can move around and enjoy their time outside without worrying about predators. It is very easy to assemble and it has proved to be very durable, too, so that you don’t need to worry about replacing it or repairing it any time soon. Furthermore, the steel is coated with a protective layer of zinc that makes it resistant to rust and corrosion. It is also waterproof which makes it a good winter chicken coop that can be exposed to various weather conditions without worrying that it will suffer damages. And, the manufacturer had the amazing idea to add a pitched roof which will prevent the accumulation of water, debris, and light snow. It is super easy for you to keep it clean, and the fact that it is equipped with a lockable steel door makes it a breeze for you to feed your chickens. Many people like this product because it is made of strong steel that is resistant to rust and corrosion. Many people say this coop is a perfect choice for various weather conditions because it is waterproof and it will not suffer any damages. Because it has a pitched roof, this hen house doesn’t accumulate water, debris, and light snow which makes it very easy for you to keep it clean. It is equipped with a lockable steel door that makes it easier for you to take proper care of your feathered friends. You can feed them without any problems. Many customers like this coop because it offers their chickens a lot of space and protects them against predators. Some of the people who have decided to give this product a try say that they don’t find the zip ties and tarp to be very sturdy and they recommend others to use their own if possible. If you are looking for a hen house that will resist in the most extreme climates, this one from BestPet might be just what you are looking for. Besides being resistant against rust, corrosion, and fading, this product can also be used as a puppy playpen. Also, non-climbing small animals like rabbits, turtles, ducks, or guinea pigs can exercise and play in this coop. And, the waterproof cover and the steel roof frame will offer its inhabitants complete protection against many external factors. Rain, snow, or sun will not disturb your pets anymore because they will be in a safe place. Furthermore, the UV protection will make your hen house last for a long time without worrying that it will crack, peel, or rip. When you are building a chicken coop you might have to spend a lot of time which can be very frustrating. But with this model, you don’t have to worry about that because it can be assembled in minutes. Many customers say that this coop is perfect for containing chicks that are big enough to forage, but too small to join the hens yet. Many people like this product because it is versatile and they can use it for multiple purposes. It can be used as a coop, cage, crate, or anything else that you might think of. Many people use this coop to keep their chicks growing safe – to protect them against hawks or other predators. This cage will also offer enough room to grow healthy and beautiful. This product features a roosting bar that will make your pets feel safe and protected. Some customers say that the joints don’t stay together as well as they should but it can be easily fixed by adding zip ties when it is assembled. Several customers say that the coop doesn’t come with instructions. However, it is super easy to install even if you don’t have the steps written on paper. The dimensions of this small chicken coop are 55″ X 27″ X 27″ which make it the perfect choice for 2 standard size chickens. What is great about this pen is that you don’t have to follow long and complicated instructions to assemble it. This means that anyone can do it, and it doesn’t require special tools or knowledge. And, it is very easy for you to have access to it because it is equipped with three large doors that can be fastened, and they also expand the living space. We know that chickens instinctively look for high roost to protect themselves from predators, and this product offers them this option. The roosting bar will make your feathered friends feel protected and well-cared for. Furthermore, the enclosed run is protected by metal mesh that will offer you the necessary visibility to be able to see what your chickens are up to without disturbing them. Many customers like this product because it is very lightweight and this gives them the opportunity to move it anywhere they need. Many people like this product because it is super easy to assemble and it only takes you around 10 minutes – no special knowledge or extra tools. Many buyers say that this pen is very useful for a sick bird or a time out pet if there are any fighting issues. Many customers say that the cage is large and offers enough space and comfort for 2 chickens. Several customers find this product not very sturdy and they recommend that you use stakes to keep it secure to the ground as it can be easily tipped over by other large animals. Some people say that it is more suitable for indoor use because it doesn’t have a shelter to protect your chickens from sun, rain, or other weather conditions. If you are afraid for the safety of your chickens you should know that this coop promises to keep foxes and coyotes away from them. The interesting design with an oval-shaped run is a great addition to any garden. Besides looking stunning and offering great protection for your chickens, this house is also very durable. Thanks to its T&G treated timber you will not have to purchase a new house for your hens any time soon because this one will last for years. And, it is super easy to keep your chickens’ habitat clean and safe, too – the pull-out tray will make it very easy to maintain. It promises to offer enhanced comfort for 3 to 4 birds. And, you don’t need to worry about assembling it because it comes with instructions that are very easy to understand by anyone. Your chickens will enjoy a healthy environment with enough light and space. Many customers feel safe to use this product because it keeps foxes and coyotes away from their feathered friends. Many customers love the unique oval design that looks amazing in their garden, and it receives plenty of positive comments from their guests and neighbors. Your chickens will feel spoiled in this luxurious coop and they will enjoy all the necessary light and space. Many people like this product because the instructions are clear and easy to understand – you just need to follow the steps and you will soon have a new house for your chickens. It is easy to keep this hen house organized thanks to the useful pull-out tray that makes the cleaning process a piece of cake. A few customers say that it seems a bit on the flimsy side compared to similar coops from more expensive brands. Several customers who have decided to give this product a try say that the maximum number of hens it can accommodate is only 4. You want to offer your chickens a great experience without sacrificing too much of your free time, and this can be achieved with a proper chicken coop. That is why you have to be careful when you are purchasing their new house, as there are certain factors that you need to take into account in order to make everybody’s life easier. In order to be happy with the choice you make, you have to know exactly what you need. The market is flooded with a wide selection of chicken coops, and what you want is to find the one that meets your expectations and delivers the results you desire. In the section below we have gathered some important characteristics that should help you make the best decision. Wooden coops have always been popular and they are still a common choice among many customers. In the beginning, most of the styles were made to sit on the ground but today almost all of them are equipped with legs in order to protect chickens better against rodents. Many poultry keepers like the wood hen houses because they make their yard look pretty. They also believe them to be sturdier and less likely to be blown away or tipped over by large animals than the plastic ones. And, the fact that they can add their own touch to it by being able to paint it in the color they want makes them lean toward this option. Also, when they are tired of one color, they can just paint another color over the original one. Plastic coops are believed to be easier to maintain and clean which makes them popular among many people who don’t have very much free time. Also, most of the times they are more lightweight than the wood ones. They come in bright colors which makes them very liked by children hence a perfect choice for school or college poultry projects. Some people appreciate the fact that they have removable lids that make the egg-collection very quick and easy. If you are looking to add a more contemporary look to your outdoor space, the plastic hen houses may help you achieve that. And, they are considered more cost-effective, being cheaper to buy and maintain. There are people who prefer to build the coops themselves as there are plenty of chicken coop ideas available on the internet to get inspiration from. Others prefer to save themselves the trouble and they choose to buy them. Regardless of which side you are on, you have to pay maximum attention to certain aspects. Choosing the right size, for example, is an extremely important factor. Even if the advertising says that a certain coop fits a certain number of chickens, you should always think about the comfort of your chickens. You must pay attention to the dimensions and according to them, you have to make your calculations. It is believed that one standard bird should have 4 square feet of floor space and one bantam chicken should have 2 square feet. In order to make sure that your feathered friends live a healthy, comfortable, and happy life, it is recommended that you follow these guidelines. If you fail to provide your birds with enough space they can get stressed out. They will start pecking and picking each other which can make them sick and eventually it can lead to death. The coop will also get smelly very fast if the space is too small. Also, the room in the run is very important – experts say that you should offer a standard bird 8 square feet of space and 4 square feet for a bantam. Choosing the right house for our hens can be quite difficult as there are so many styles available out there, from the ones that can be moved around anytime to those that are not meant to be carried around too often. Let’s have a look at both of them and see what the advantages that they bring are so that you can make up your mind without any regrets afterward. The great part about a movable chicken coop is that it can be moved around every few days, which prevents bald spots appearing in your yard or garden. But, you have to keep in mind that the chicken tractor needs to be lightweight enough for you to be able to move it. If you have a riding mower or an ATV you don’t have to worry about this aspect though. A static coop is great because you just need to choose a spot for it and then you can leave it there for as long as you want without worrying about it anymore. Also, if you are dealing with predators, this type of coop is your best friend. And, because it is built above ground, you don’t have to worry that it will flood during heavy rains either.